15miles. Leaders: Norman Thomas and Chris Langabeer. 23 walkers. 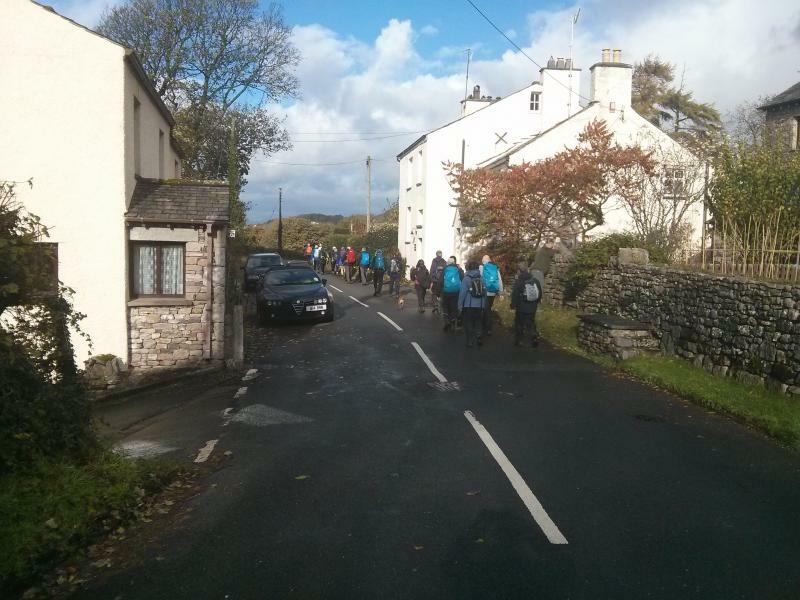 23 walkers boarded the coach in Kendal for a short journey to Arnside to begin the 3rd section of the walk. Our first glimpse of Morecambe Bay was of the tidal bore speeding up the estuary. On alighting the coach in bitterly cold weather we walked alongside the estuary to the village of Storth. 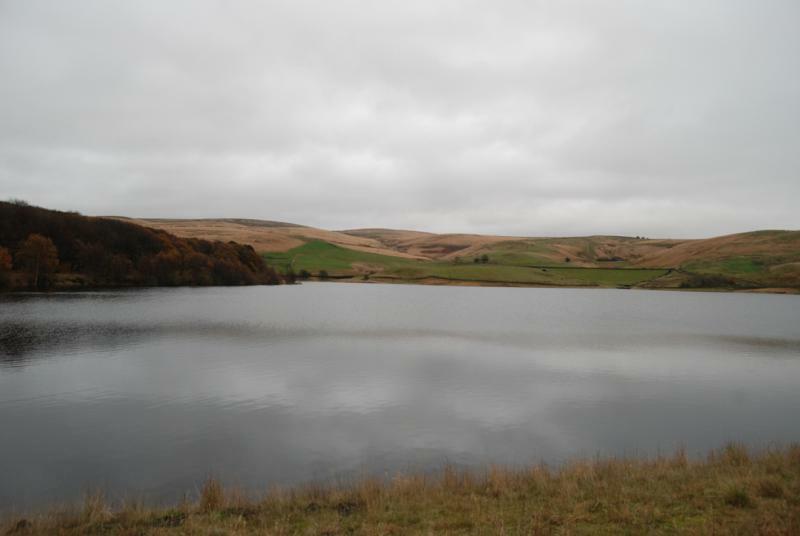 From here we turned inland to climb through Haver beck Woods and descend to Dallam Deer Park where we saw a herd of small Deer. 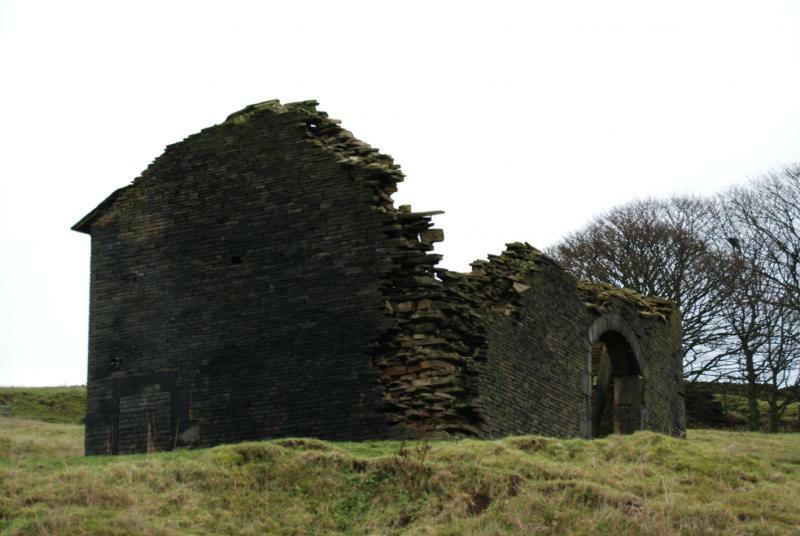 After crossing the River Bela the walk continued through the village of Milnthorpe, on to pass St Anthony’s tower, a small folly built to commemorate the passing in Parliament of the reform act of 1832. We continued on through the village of Haversham to reach Levens Hall and its magnificent gardens and it’s Herd of Deer. 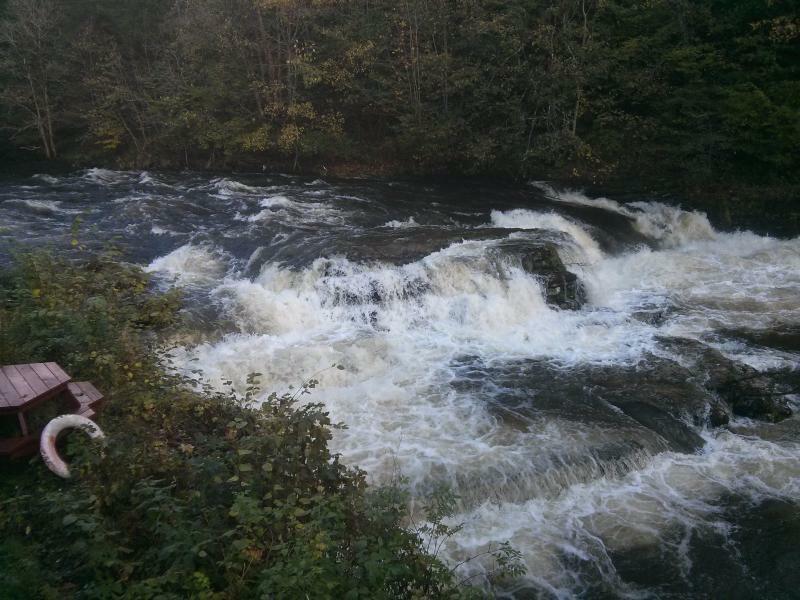 After the Deer Park we walked alongside the River Kent, passing fast flowing rapids along the way. Leaving the river the walk continued along the towpath of the disused Lancaster to Kendal canal before turning again to meet the River Kent and a riverside walk back to our cars in Kendal. Thank you to Peter for the photos. Please click on the link below for Howards Photos. 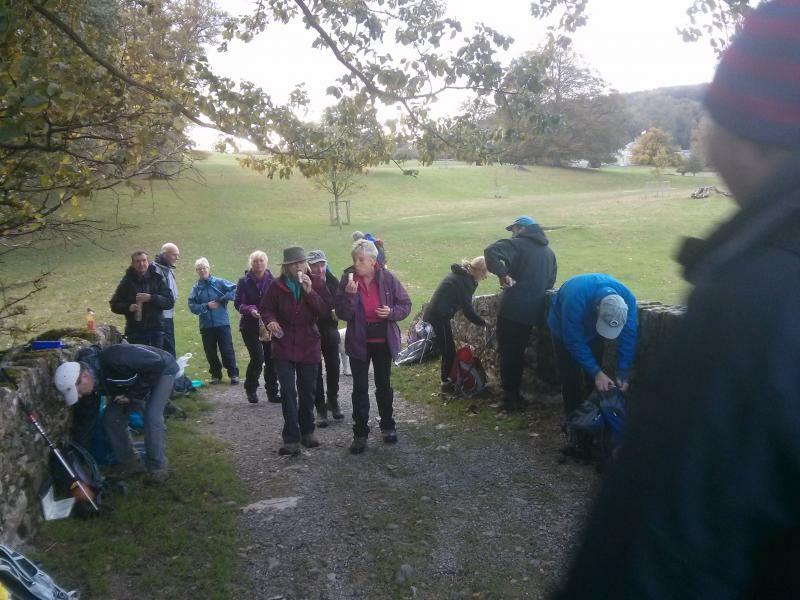 In the absence of a volunteer to write up the walk, looks like I'm putting pen to paper, or more orrectly, fingers to keyboard (since found that Barbara was about to write the report but luckily had not yet started to write) . 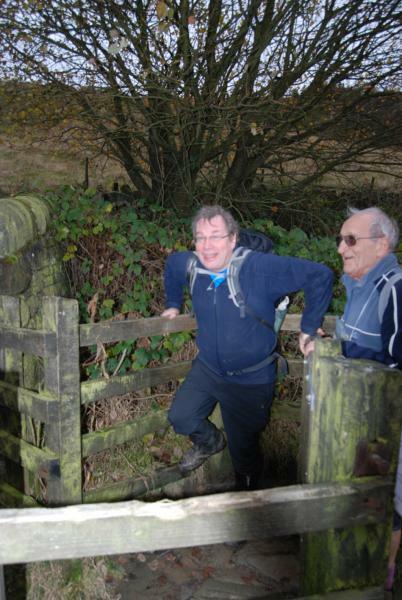 Mike had taken on leadership for the walk at fairly short notice so had not had the oportunity to recce the walk. 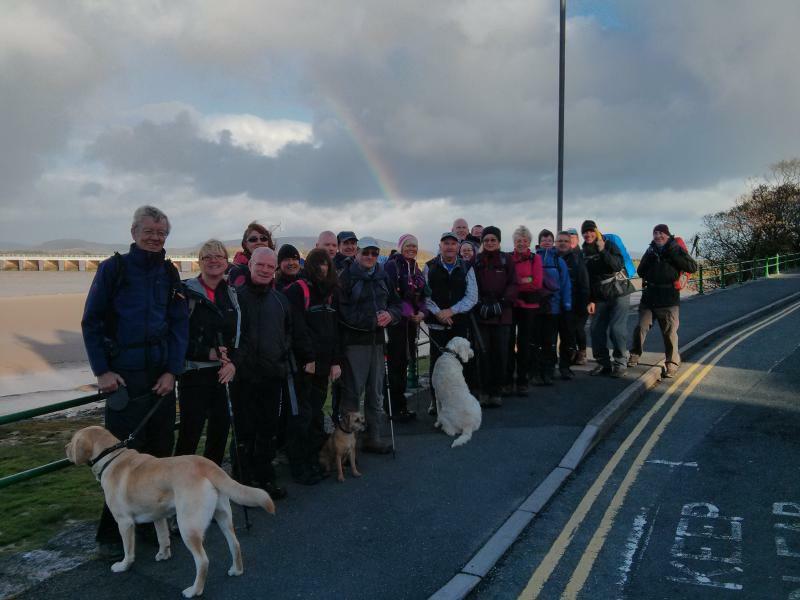 Twenty sturdy walkers and one dog from East Lancs and further afield gathered at 9am in the car park at Jumbles Country Park. We had a nice surprise in that the pay and display machine had been officially disabled with a green coat to provide free parking : whether this a permanent reprieve, I know not. 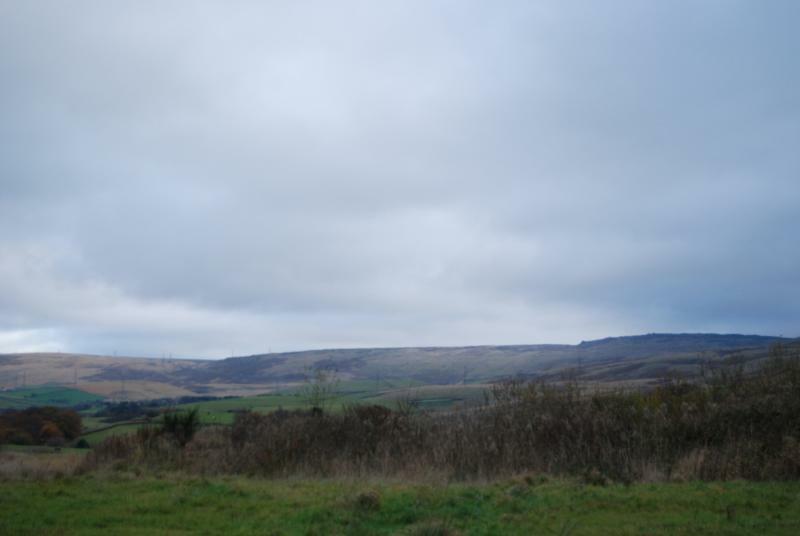 The weather was quite mild with a heavy mist and lack of breeze. Setting off south we soon had our first route conundrum. A new café for the fishermen had opened and this provided a new route to the lane that headed up to Bradshaw Road. 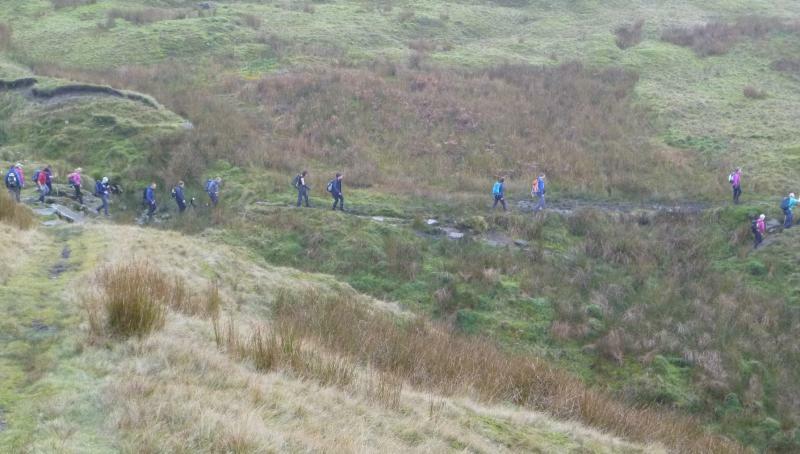 The next section towards Affetside was particularly unpleasant underfoot with very boggy ground to plod through. The monthly meeting place for LDWA group meetings was then reached and we wondered for how much longer will the pub be open for our meetings (or beer and food for anyone for that matter). 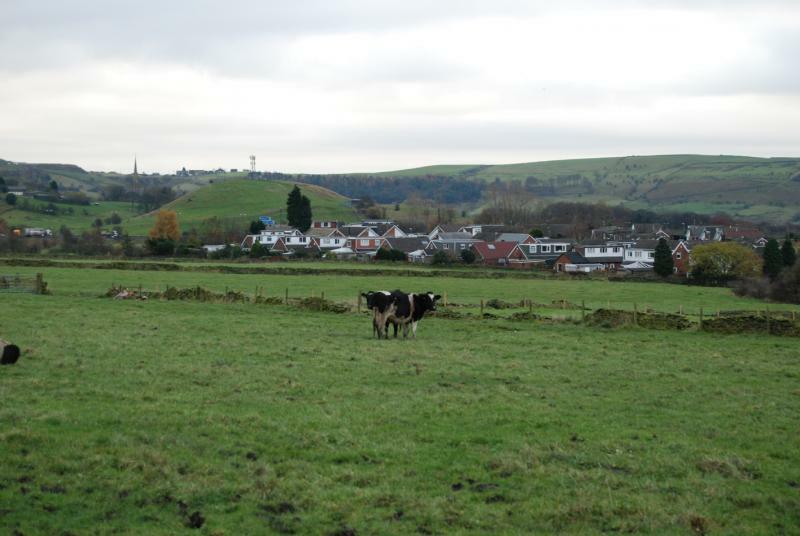 Around 10.30am we were crossing the road by the former mill at Hawkshaw and on our way towards Peel Tower. Just below the tower (although we were unable to see it so some of the group had no idea where we were) we enjoyed our morning coffee break. 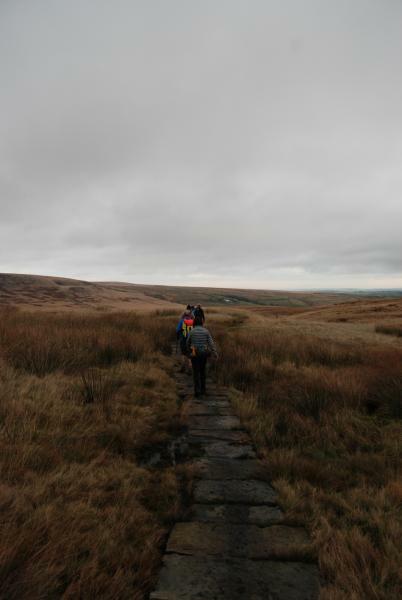 Onwards across Holcombe Moor with the poor visibility causing a minor miscalculation but we were soon back on track stopping at Pilgrims Cross and then on to the Rossendale Way. 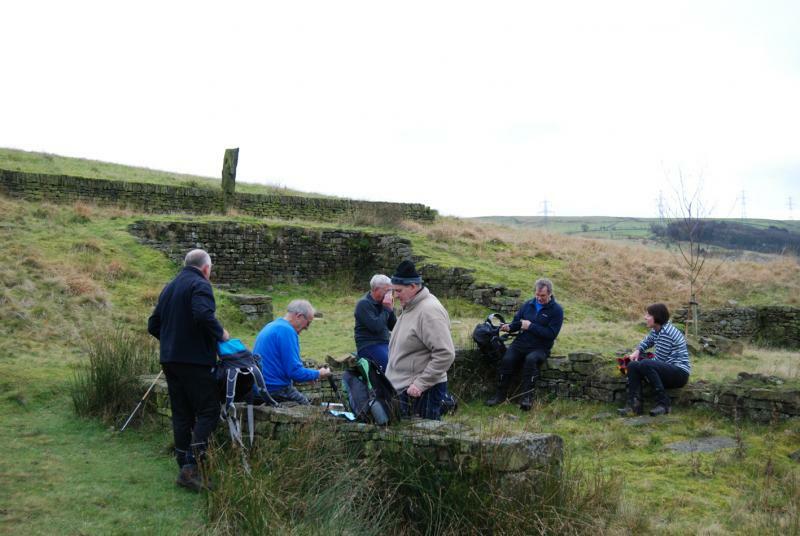 Just after 1pm we reached the chimneys where the old derelect walls of buildings made an ideal lunch stop. The sun didn't come out but we could see some brightness with the mist clearing - then it started to drizzle! 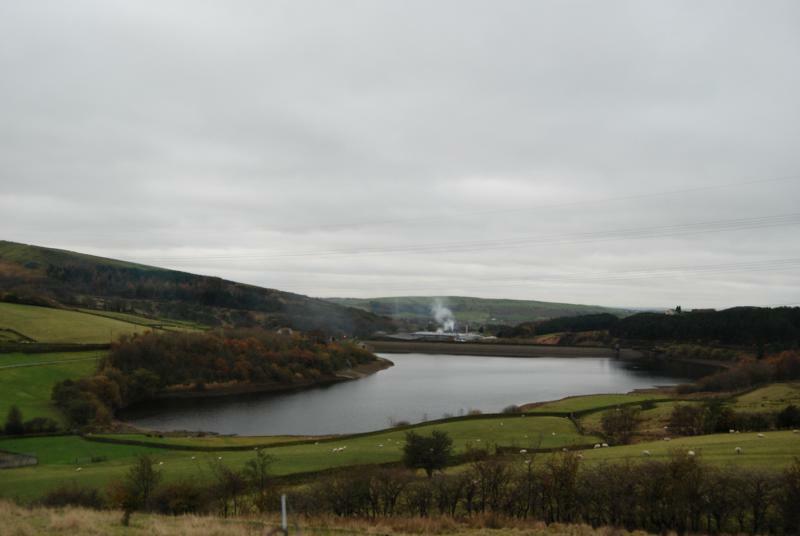 Continuing on the RW above Ogden and Calf Hey Reservoirs. 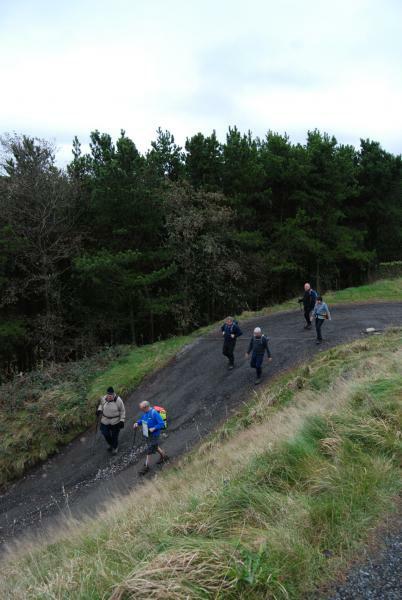 Next came a good hard climb, nearly 400ft of ascent in just over half a mile. 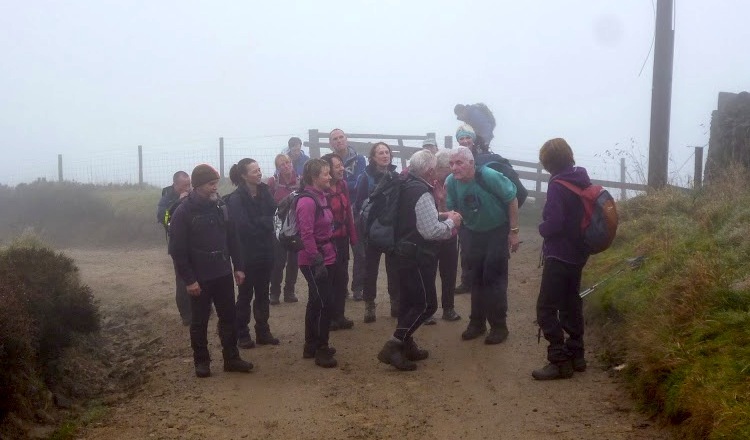 There was some disussion as to it being the correct route, maybe the mist was causing havoc with walkers' orientation, but having been on the path a few weeks back I assured our leaders that it was. 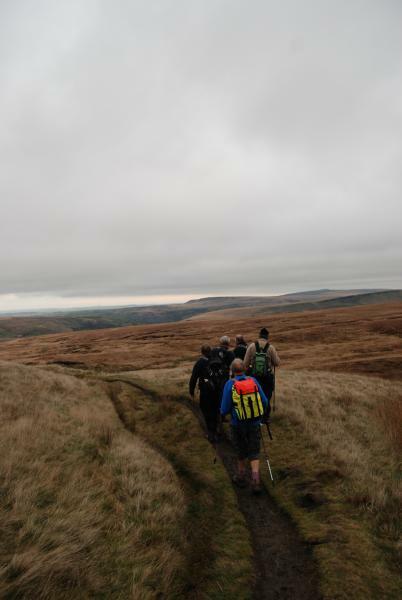 Back up on the moorland, some were adamant that we were on the wrong path and on the wrong side of Hog Low Pike which was out of visibility - again I stated my recent experience on the route (where I had made plenty of navigational errors but this was not one). Soon Hog Low Pike appeared as I expected over to the right of our path and the terrain improved as we heaed for Cloughhead Farm. The next section was uncharted territory for me so I hoped someone else was confident of the route. 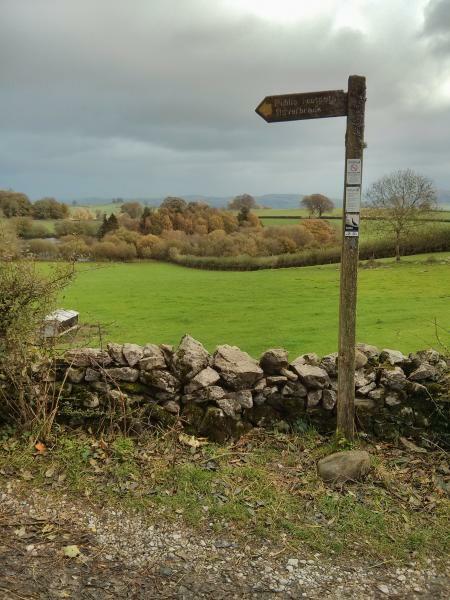 We then encountered the challenge of navigating around two farms where the rights of way have changed significantly over the years : twenty minutes instead of five. 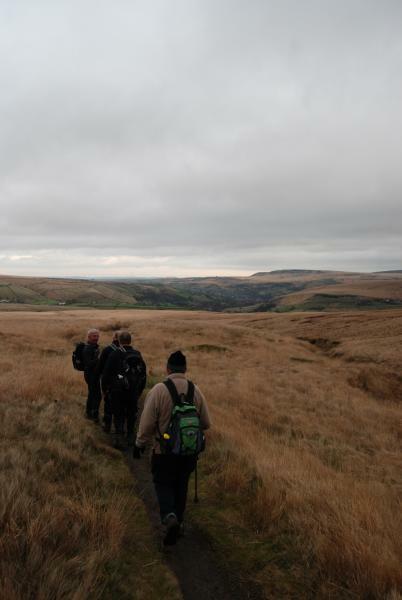 Due to the time of year, underfoot conditions and poor visibility, the walk was a good challenge. 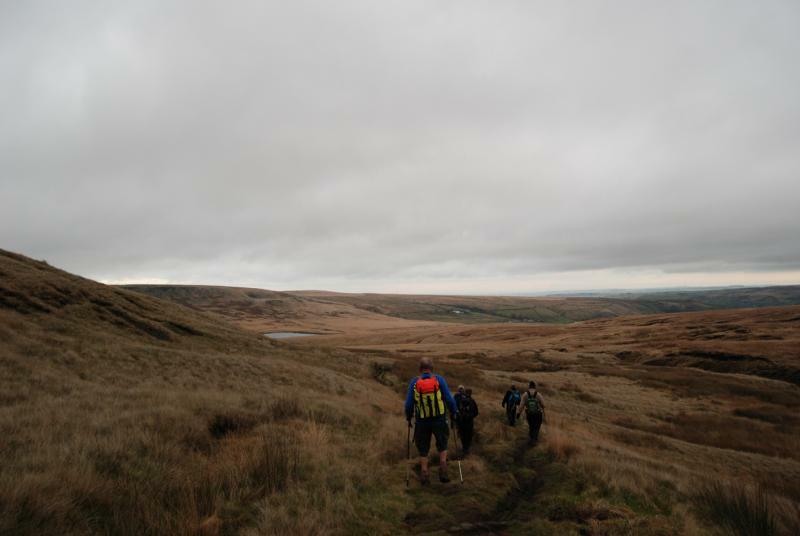 We had clocked the distance at 18.5 miles with over 4000ft of ascent. 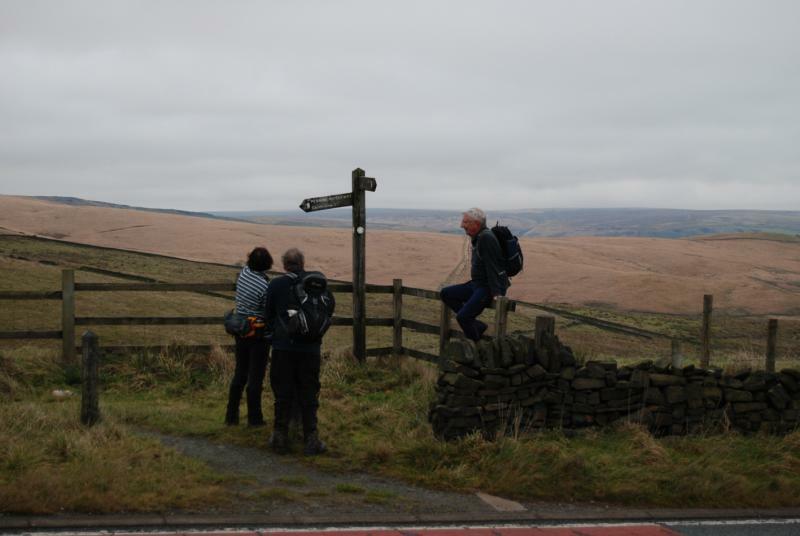 It was enjoyable but probably more recommended as a summer walk where you are are not limited by the limitations of daylight and hopefully the potential to appreciate more views. 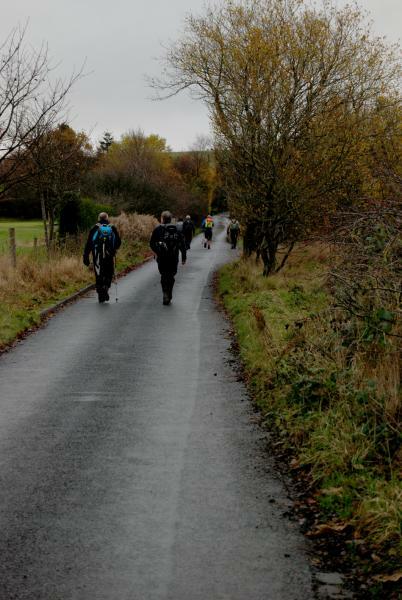 Although causing the occasional issue with the route, It was a good decision to walk the route anti-clockwise rather than clockwise as the last few miles were on good paths, the traditional route would have see us plodding through mud late in the day. We did however get some photographs, mostly taken by Howard Smith with a few from me (click the links below). Badges are available for the Spanners Round from Norman Thomas (tel no in Strider). 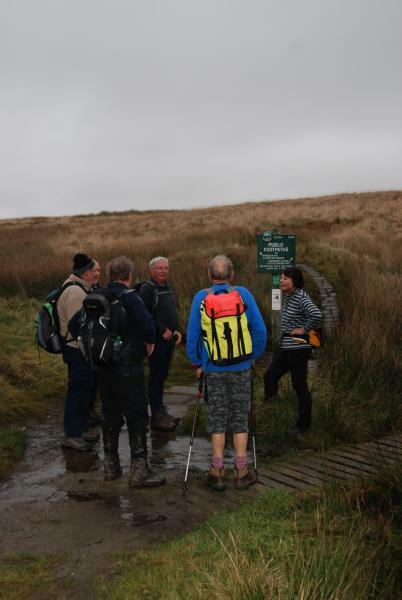 The weather forecast was terrible, so only the hardy turned up for this East Lancs LDWA midweek walk that I’d volunteered to lead. 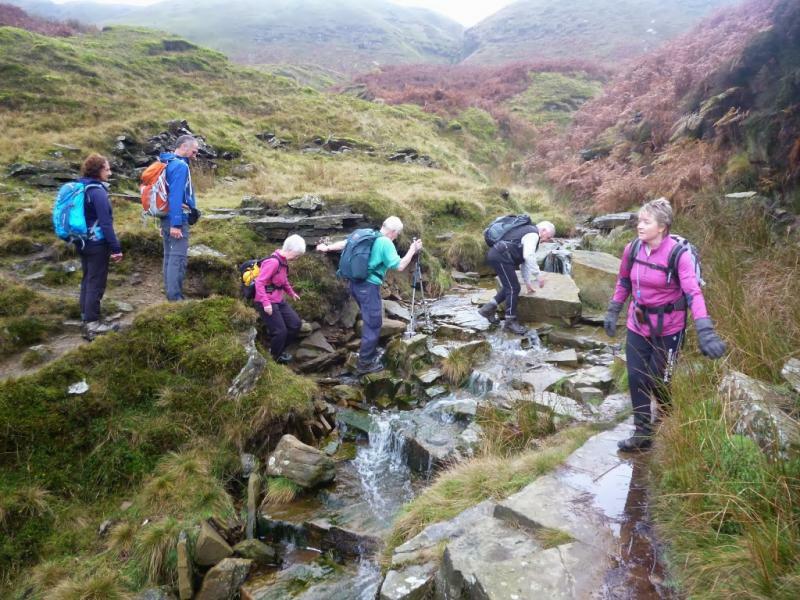 Five Plodders and a rather jolly couple from Glossop. As it turned out, the weather was fine and sunny - most of the time. The route started along the Bridgewater Canal in Stretford, where new signage for the Bridgewater Way glinted in the sunlight. 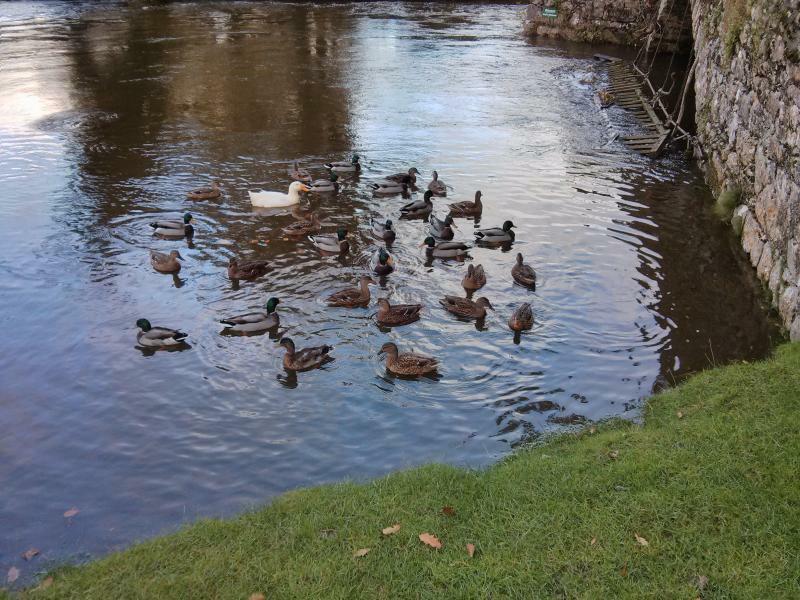 We set off under a bridge, towards Manchester, in an area where Canadian geese rule the towpath and the swans are used to being fed. After passing under the A56 road at Gorse Hill, a small canal basin with newly built houses was negotiated before reaching the canal junction in Old Trafford. Here we waited for a while as Bernard had failed to make the 10 am start time and might have rushed headlong to Worsley if we hadn’t paused to guide him over the bridge and onto the unrefined towpath that heads into central Manchester, linking the Bridgewater Canal with the Rochdale Canal. He soon joined us, perspiration from his valiant efforts to catch up dripping from him like a Chinese wrestler’s jock strap cooked in chip fat on a greasy afternoon. The onward route normally passes containers stacked high in Trafford Park, as well as a large stadium, but currently a footpath diversion forces the towpath walker onto the busy roads of Trafford Park where, every May, the Manchester 10km race takes place. 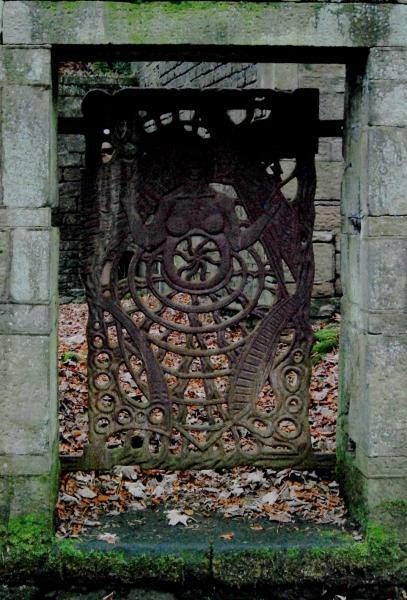 The diversion did enable us to take a glance at some Trafford Park sculptures. Entitled "Skyhook" this is one of two 17 metre high hook and chain sculptures, unveiled in 1995 as part of the regeneration of the Trafford Park Industrial Estate. The diversion re-joins the canal shortly before the towpath passes under, then over, Throstle Nest Bridge. Trams to and from Eccles rushed past as we continued relentlessly towards the city centre. Beside Pomona Docks, only the graffiti gave away the fact that we were viewing an industrial, not a rural, scene. 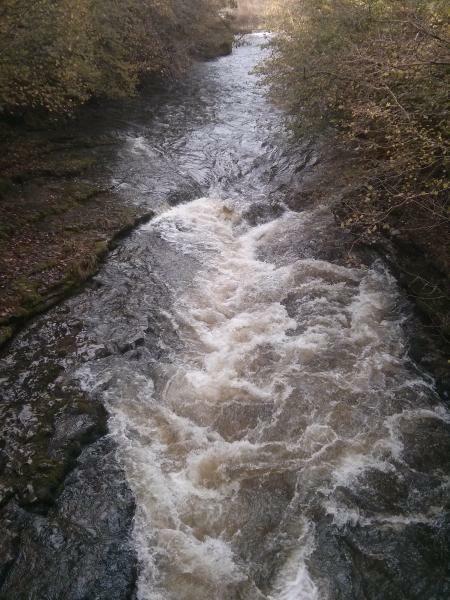 Water, perhaps from the River Medlock, gushed from a culvert and under the canal, entering the River Irwell/Manchester Ship Canal. The towpath headed under freshly painted bridges and over a lift bridge that must have seen much use over the years, towards Castlefield, where the canal basin is now overlooked by the Beetham Tower, and Merchants Bridge introduces a modern take on bridge architecture. This area has been cleaned up quite impressively, and a heron was seen fishing from below the balcony of a new apartment block. After a tea and cake break we made our way slowly past Dukes 92 (named after the lock number), and through the long Deansgate Tunnel, with the Beetham Tower slowly coming to dominate the aerial scene, overlooking the ubiquitous sight of a brightly painted duck house in the garden of a local MP. New and renovated buildings in Manchester city centre were passed as the towpath approached Oxford Road. Behind Whitworth Street we passed an old mill chimney that has avoided demolition, then the towpath was briefly impassable as the canal proceeded through Manchester’s Gay Village. There was no sign of Norman, who had been expected to appear on this walk. The historic site of Sackville Gardens, with its modern ‘Time for Action’ sculpture, was soon reached, just near the old main building of UMIST, home to much scientific innovation and early computer development. The towpath recommences at Minshull Street Bridge, built in 1806, and we followed its trail of patterned bricks through the centre of Manchester to the horrid squalor of an underground route through Piccadilly. 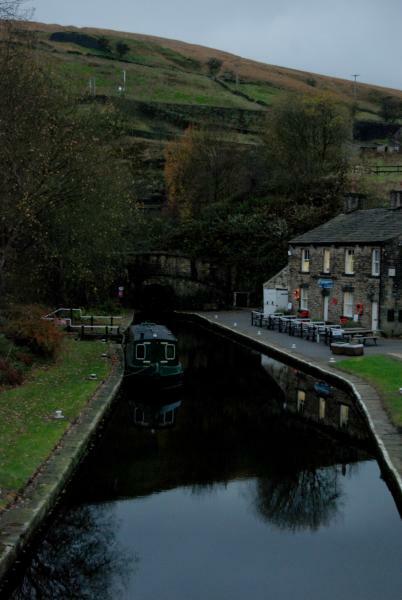 The canal now divided, with our route on this occasion heading towards Ashton and leaving the Rochdale Canal to the Canadian geese. Less restoration has taken place on the Ashton Canal, but there are some new buildings, and a restored lift bridge, before the towpath passes attentive fishermen under the shadow of the City of Manchester Stadium. Soon after passing under a water pipe, the provenance of which Reg would no doubt have expounded upon had he been present, we left the Ashton Canal and headed into Philips Park, 'one of Manchester's finest green spaces', opened in 1846 as one of the world's first municipal parks.Here today’s team comprising Bonnie, Neil, Don, Bernard, Barbara, Clyde, and Martin, lunched on some children’s picnic benches. No children were disturbed or photographed. New singletrack mountain bike routes are also well signed, but I struggled to explain that they are forbidden to walkers. Mountain bikers should enjoy a visit. Parking and bike washing facilities are available at the nearby Velodrome (National Cycling Centre). Beyond Clayton Vale, narrow paths full of leaf litter continued beside the railway line, above Medlock Vale. Our route took a strange turn in Clayton Vale, where only Bonnie and Barbara followed the correct path and others got stuck on what they thought was a giant roundabout controlled by a midget plumber. 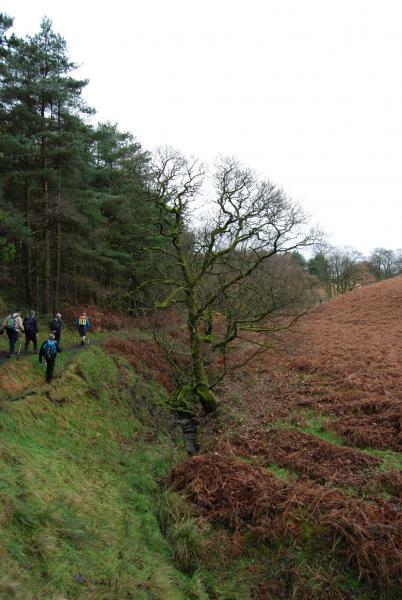 Our path continued high above the river and Medlock Vale, with views towards our destination opening out. 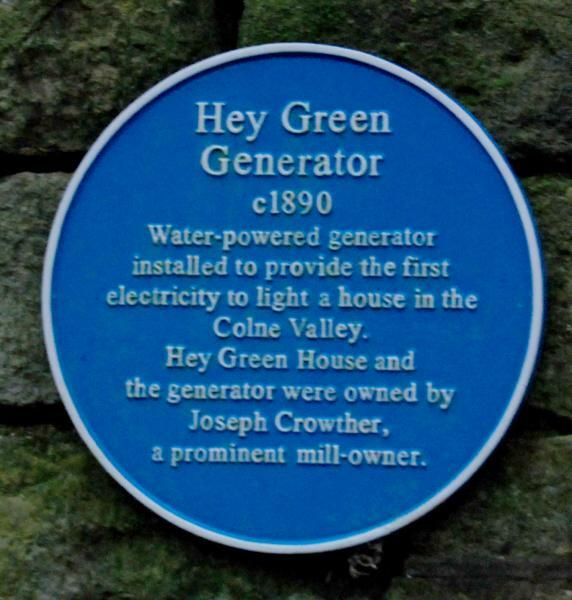 Another canal was reached - the Hollinwood Canal, which links the Ashton Canal with tram roads from the Oldham coalfields. 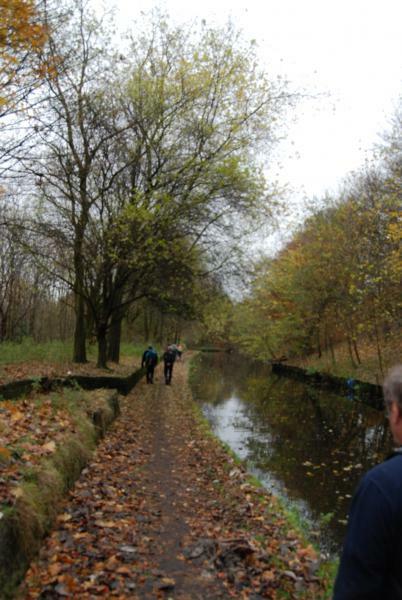 The Hollinwood Canal has not yet been restored, though in places the towpath and canal are pretty much intact. Elsewhere, there are major obstacles to restoration - the M60 motorway, for example. Berries glinted in the sunlight. 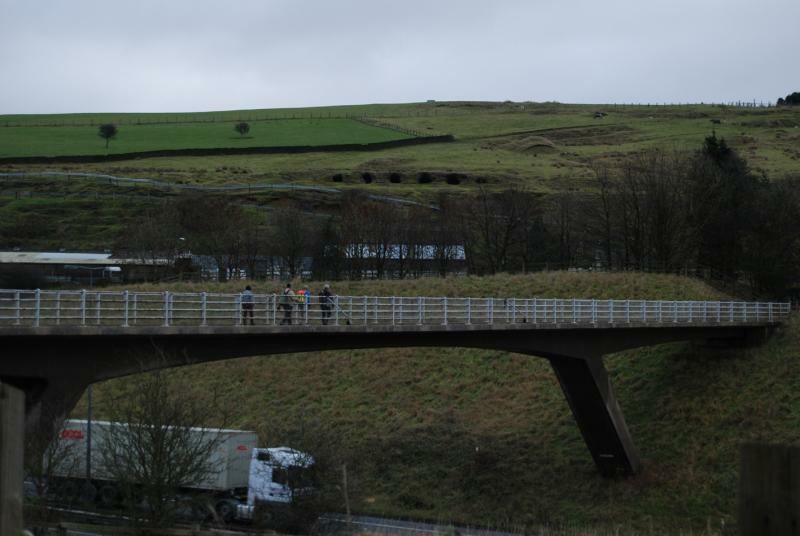 After crossing the motorway by a high footbridge, we were welcomed into Daisy Nook Country Park, where drinks and ice creams are always available, and of which facilities we availed ourselves. I should have paid more attention to the signage, as shortly after the Visitor Centre, with the distraction of Clyde’s intent on showing me how unlock the mysteries of my Satmap GPS unit, I took an inadvertent diversion to Crime Lake, when we were heading for Park Bridge! Here, after the minor obstacle of the M60 motorway, the Hollinwood Canal continues on its merry way. We passed a sculpture masquerading as a footbridge, or was it the other way around? And approaching journey's end, as the weak light faded, the River Medlock seemed to widen as we proceeded towards its source! The light was just adequate for a final photo of woodland near Bardsley, on the edge of Oldham. 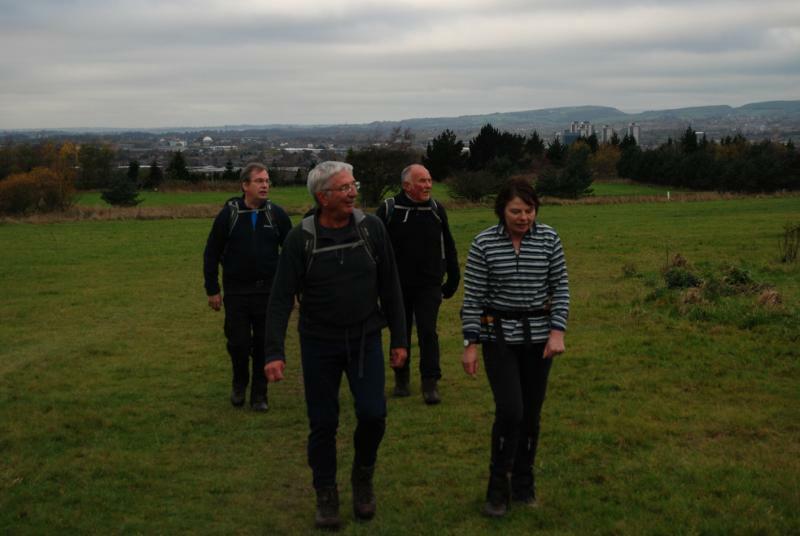 Then, with some of the team members showing signs of weariness, we joined a cycle route for the easy walk to Alexandra Park, before ultimately gravitating to the delights of Oldham Mumps Metrolink Station, by which time all bar Bernard and Barbara had peeled off onto alternative routes home. The route, excluding diversions, should have been 24 km, but the GPS showed 28 km. This was an excellent day out in surprisingly clement weather. Thank you, everyone, for coming along, and please accept my apologies for the Crime Lake diversion, which can only be described as a *****. 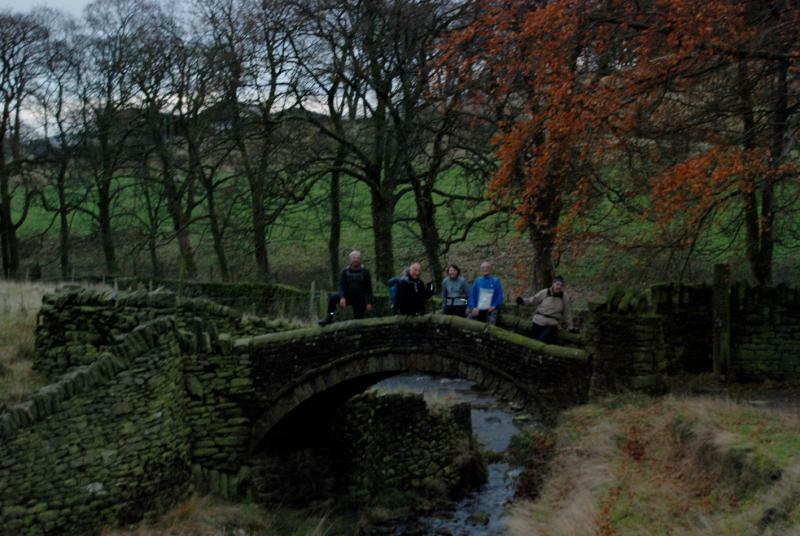 Seven walkers turned up on a beautiful frosty November morning at Sandbrook Park, Rochdale (three having met at Marsden earlier, to leave two cars). This was a continuation of John’s series of walks entitled 36 degrees (nobody knows the significance of the title except him). 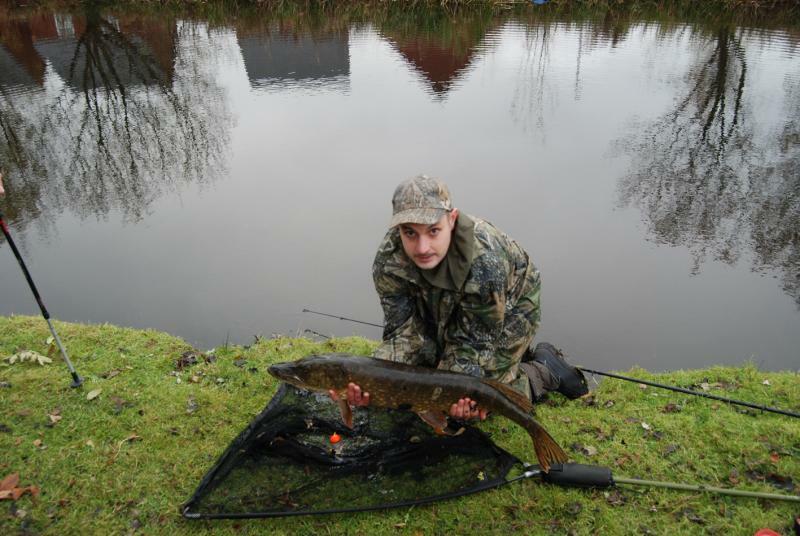 We started along Rochdale Canal in the direction of Littleborough, as we passed a fisherman, near Kingsway road bridge, as he was in the throws of landing a 10lb pike so we watched and took photos as he landed it. 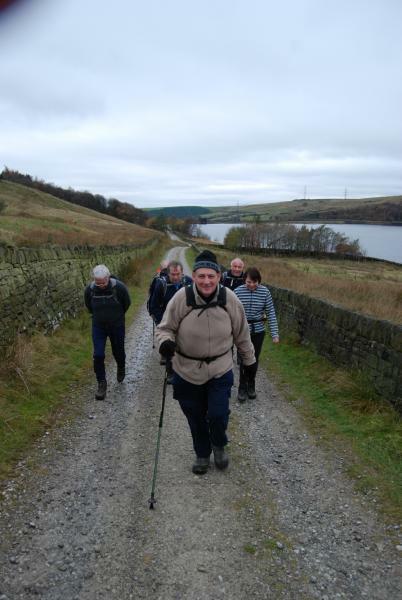 One of John’s aims was to take people on paths that they had not previously walked and with four local walkers along they may have proved difficult but he still managed it for quite a lot of the route. Leaving the canal at Firgrove we walked over the bridge and onto playing fields and then turned in the direction of Wildhouse Lane stopping for a drink before reaching it. 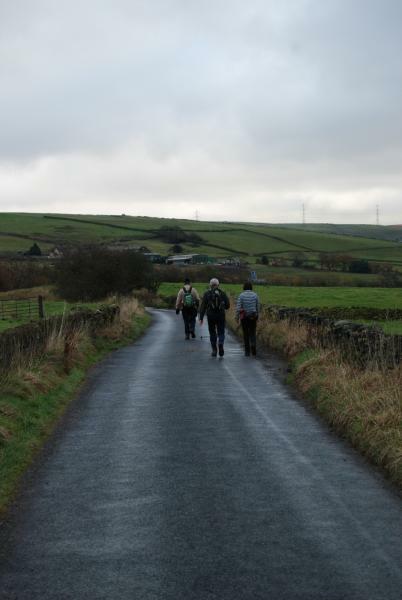 After passing the Belavista Restaurant we turned left up a footpath and headed towards Tunshill Golf Club and a bridge over the M62 heading in the direction of Ogden reservoir. As we proceeded along the paths it appeared one farmer wasn’t too happy with a footpath through his farm and had placed a JCB across the gate into his farmyard, but this didn’t deter the group and we managed to negotiate our way around it. 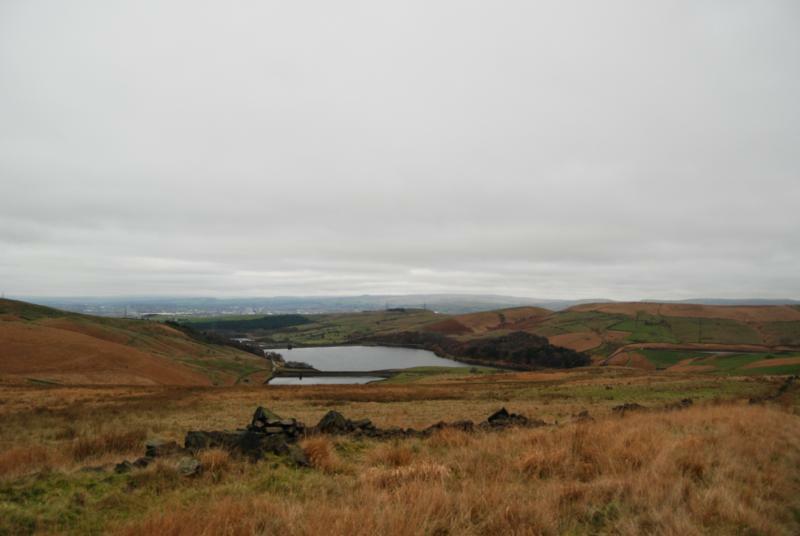 The route continued up and came out just above Ogden Reservoir. 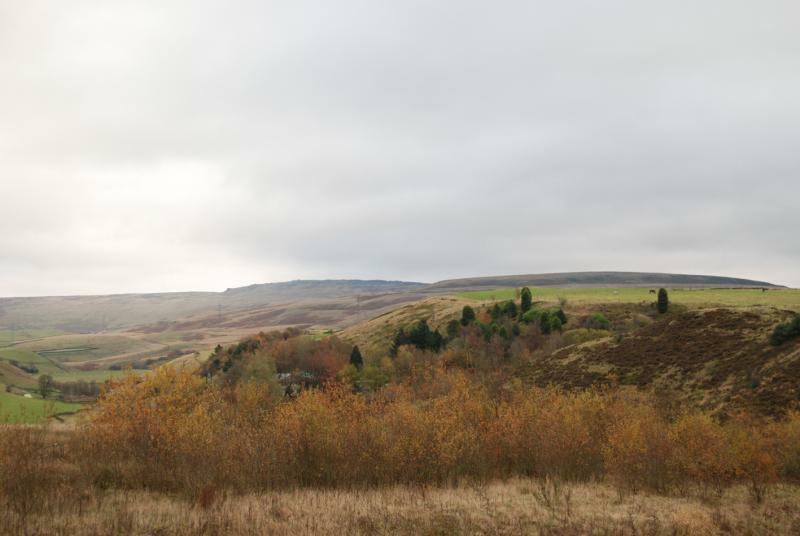 By this time it was lunchtime and John had found a good spot at a dismantled farmstead with good views across the valley. 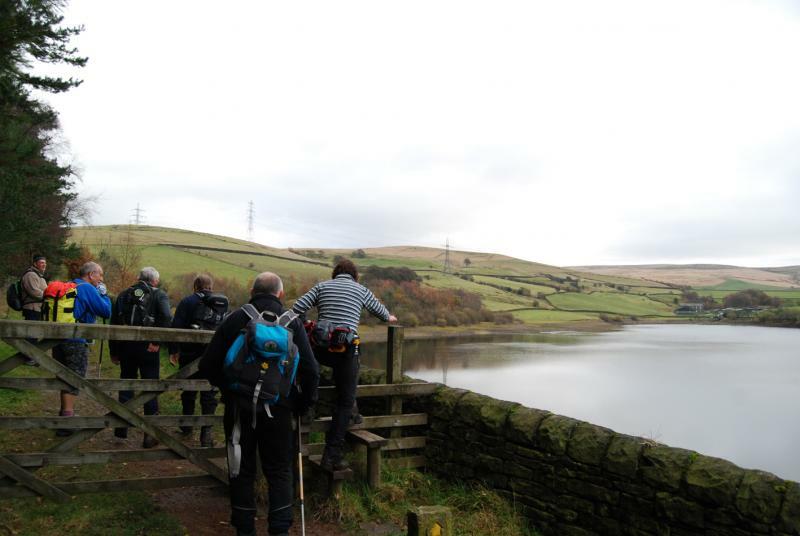 It was onward and upward following lunch past two further reservoirs and up over the Denshaw-Ripponden Road and across to Readycon Reservoir. 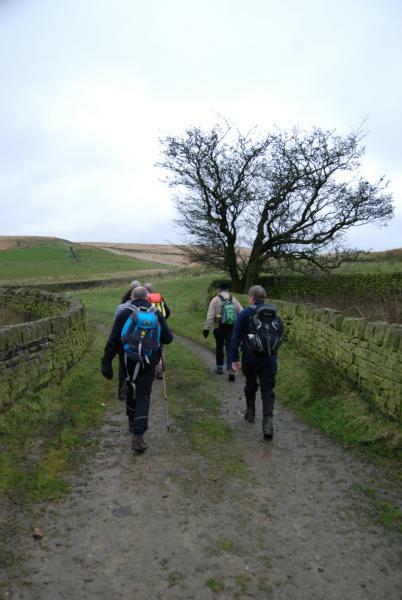 We where now on the Station to Station path which we followed all the way to Marsden. 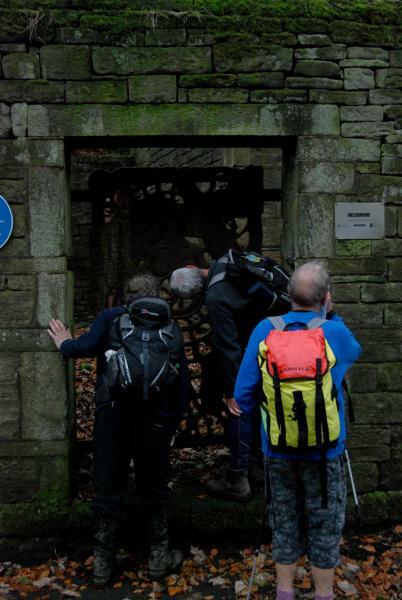 A further drink stop at a pack horse bridge and a picture opportunity at an interesting gate until we reached the entrances to Stanage Canal and and railway tunnels which signalled the end of the walk. 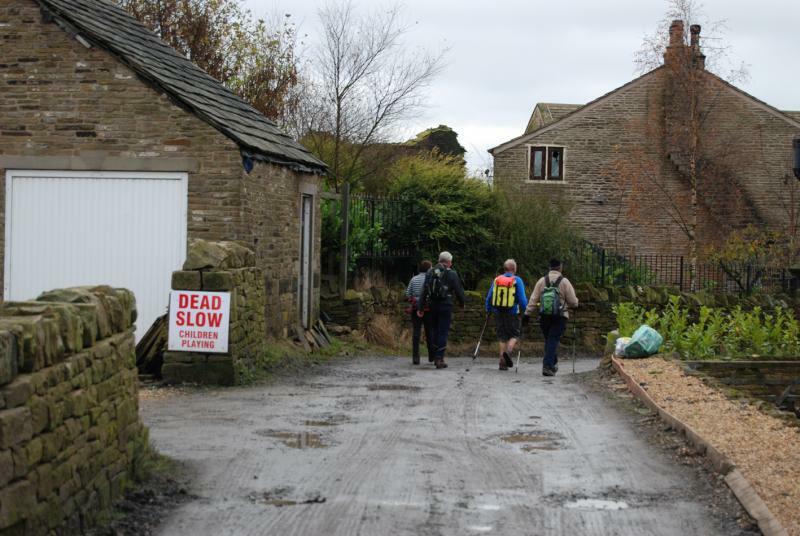 The walk had started on one canal towpath and finished on another. 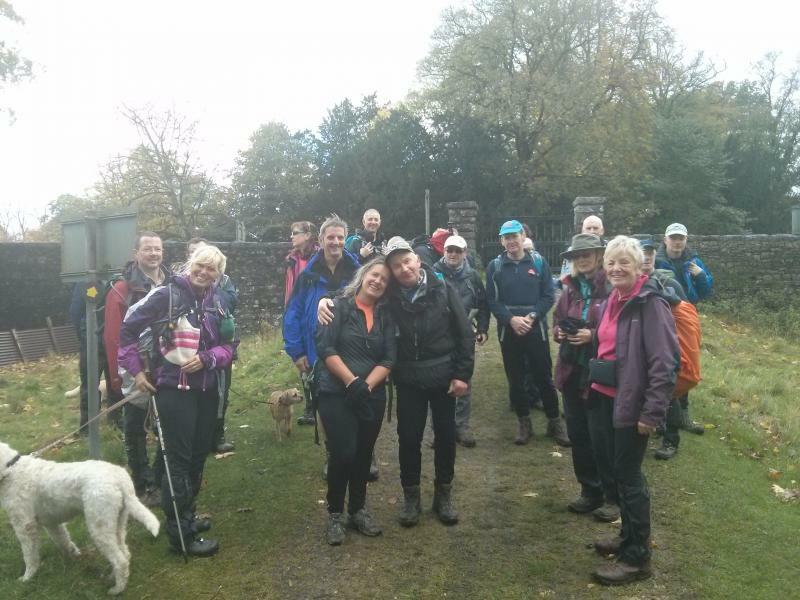 A fine walk and day out, thoroughly enjoyed by all who took part.